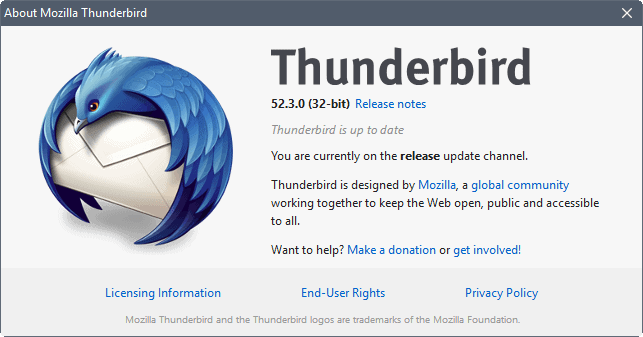 Mozilla Messaging released Thunderbird 52.3.0 on August 16, 2017 to the release channel and all supported operating systems. The new version of the popular email client is a bug fix release; means, it fixes issues in the client but does not introduce new features to it or make changes to existing ones. Also, no security updates in the release. Thunderbird's automatic update feature may not pick up the update right now. You can check for new updates with a click on Help > About Thunderbird. If the new version is not picked up, you may download and install it manually instead. Head over to the official Thunderbird download page and select the version that you are using from the list of supported languages and operating systems. Most of the issues that Thunderbird 52.3.0 fixes impact only a small number of systems the email client is installed on. Thunderbird 52.3.0 has two known issues that are listed in the release notes. The first affects users who select Send To > Mail recipients on Windows. This does not work anymore. A solution is provided; Mozilla Messaging asks users to install the Microsoft Visual Studio 2015 redistributable runtime library, or the Universal C Runtime for Windows Server to fix the issue. The second issue causes multiple requests for the master password when Gmail OAuth2 is enabled. These issues probably don't affect to many users of the email program either. Still, for those affected by at least one of the fixed bugs, it is a welcome update. Since Thunderbird 52.3.0 does not fix any security issues, there is no rush to install the update unless you are affected by one of the issues that were fixed in the release. Now You: Thunderbird, or another program? Which software do you use for email? There are two of us here. One uses Thunderbird. One uses eM Client. Today we received a large winmail.dat file into Thunderbird, which the unsupported Lookout+ 1.2.15 add-on would not extract without corrupting the files. eM Client to the rescue! With Thunderbird I do not need the Quick Filter Bar that’s why I hide it. Most of the time when I start Thunderbird, the Quick Filter Bar is displayed. Years earlier I switched to FossaMail (Unofficial/unpublished private build), the Quick Filter Bar does what I ask. Is thunderbird also moving to webext addon system? Is end-to-end encryption support still planned for a future Thunderbird version ? Some time ago IIRC there was a question from the developers to the community about what path Thunderbird should take, and support for encrypted mail was one of two paths. I wonder what’s up with that. Drag and Drop in the address book still doesn’t work. No 64-bit edition? Geez. Does this even use e10s yet so the massively slow global update/download/import of mail on initial installing of the program doesn’t entirely block the main UI thread, if not hang the app before users even get a chance to start using it? e10s is well suited to Firefox, but isn’t well suited (or oven poorly suited) to solve Thunderbird’s threading contention – which are more multiple micro architecture issues with no one single silver bullet to solve them all. Thunderbird 52.3 has security updates. Thunderbird Problem with IMAP (AOL) Passwords – Repeated Request to enter password. I’m running Thunderbird 52.5.0 (32-bit) on Windows 7 SP1 (64-bit) on Dell8103. Have several different AOL Accounts. Whenever I start up TBird it asks for several of the password, sometimes repeatedly. I do use Password Manager. See a lot of posts on this around but no solutions. Thunderbird 52.5.0, Win10. I keep getting email connection to server time out messages and can not fix it. There is no time out settings and no Disk Space timeout tab as was in older versions. Tools>Options>Advanced>Network>Disc space tab is missing and I could not find an appropriate timeout setting in Thunderbird about.config. Does anyone know how to change the timeout time to fix this problem in version 52.5.0 or related series releases?